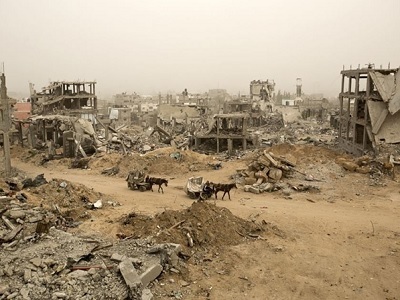 The Palestinian committee responsible for following up the submission to the International Criminal Court (ICC) regarding allegations of Israeli war crimes has convened in the occupied West Bank and Gaza to discuss the latest developments, spokesman Ghazi Hamad has revealed. The committee, which is headed by senior Palestinian official Saeb Erekat, reviewed the latest reports about the meetings between its representatives and ICC officials which took place in Amman between 19 and 21 March. Hamad said that a delegation will travel to The Hague this week for a meeting with some international law experts. They will discuss the development of a plan to speed up the start of the investigation into Israeli crimes. The meeting also touched on Israeli moves aimed at undermining and obstructing the work of the committee in international forums, Hamad pointed out. This included Israel’s tactics of intimidating and threatening all parties involved in documenting its crimes. He cited as an example Israeli attacks on human rights organisations, which he insisted are aimed at undermining the will and determination of the committee and its members. Erekat thanked civil society and human rights organisations for their special role in the struggle against Israeli criminality. The reports and documents that they have prepared, added the PLO official, confirm the need for the ICC to play a part in bringing Israeli leaders to account for the crimes they have committed.